It may not be officially summer on the calendar yet, but it’s summer in Pesaro. It’s June 1 and the German tourists are here by the busload, crowding the boardwalk and the gelaterias, and the beach looks like a sea of umbrellas. Alex and I took a walk at 10 a.m. and people were already swimming and tanning their over bronzed skin. 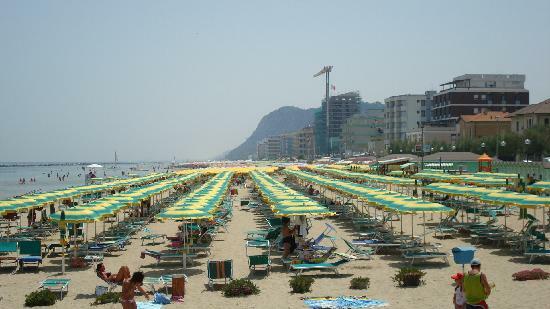 I’m not part of the sunbathing culture so Italian beaches aren’t my favorite (I have a preference for the natural beauty, cooler weather—and waters—of the Oregon coast), and Pesaro is a very commercial city in the summer. Many people rent out beach umbrellas for the summer so they can guarantee a space on the sand. However, there is something to be said about living in the centro which is a 5-minute walk from the water—many locals take a dip in the ocean on their lunch break and I’ve seen entire classes of school kids frolicking on the beach during their recess—or maybe it’s during an actual class? It’s also great to live a stone’s throw away from some delicious gelato. Trust me on this—the coconut and mango combo is out of this world. This entry was posted in Italy, tourists and tagged beach, gelato, Italy, Pesaro, summer. Bookmark the permalink.